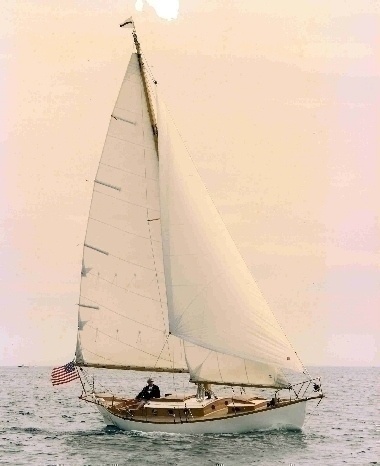 Lily, originally Shark, is a modified L.Francis Herreshoff "Wagon Box" design. Shark was built in 1977 by Rose in Manchester, MA. Her hull was traditionally constructed of cedar planks on steam bent oak frames. Her decks were 1/2" Iroko on top of 1/2" plywood, and trim (coaming, toe rail, moldings, etc.) was varnished oak. By the time Bart Jones purchased Shark in 1982, moisture had seeped in through the Iroko and rotted the entire plywood underlayment. Replacing the deck required removal of everything on top which came off in splinters having been bedded down with 3M 5200. Though a bigger job than Bart had planned when he bought her, the new Lily has layed solid teak decks, all teak trim, new insides, and a new Herreshoff type hollow spruce mast. Here's the original Wagon Box moored in Belfast, ME. 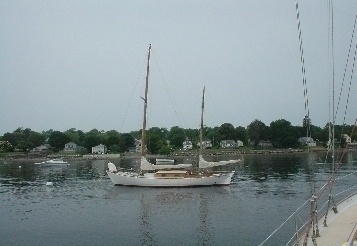 Notice that the original design was ketch rigged and had no bow sprit.